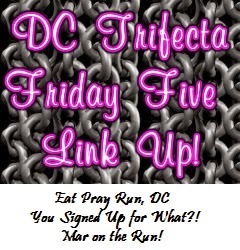 On Fridays, I link up with the lovely DC Trifecta ladies for Friday Five: Courtney at Eat Pray Run DC, Cynthia at You Signed up for What?, and Mar at Mar on the Run. This week's theme is "What's New". 1. I tried out Pure Barre for the first time this week. It was crazy intense, and I felt completely out of shape! If I had the money, I would go a couple times of week - I could really feel the burn. The class really worked my muscles – everywhere! You can read how the class went here. 2. Lollapalooza weekend is here! I can not believe that it is August already! I am super pumped for 3 days of awesome music. My schedule is jam packed with some pretty rockin' bands, and other than possible rain in the forecast, looks like it'll be perfect weather (knock on wood... it's usually about 100 degrees with 100% humidity, plus at least one big storm every year making the festival grounds a real mess). Anyone else headed there? 3. Heel inserts have arrived. As some of you may know, I've been having some issues with my arches being in pain. I ordered some heel inserts that are supposed to be pretty good at alleviating such pain. I wore them all day today, and though they felt a bit odd (I'm sure I'll get used to them), I did notice that they made my feet feel better. Here's hoping they continue to do so, and the pain subsides completely. I plan on being the girl in gym shoes all weekend, even though I usually like to wear my Toms at Lollapalooza. I really think it's necessary to have some good cushion and support over the weekend, especially since I'm starting off with pain before it even begins haha. 4. I've become obsessed with American Ninja Warrior. I just enjoy the show so much! I love it when I see regular joe's do well. You know, the kind that have jobs like animation artist that means they aren't in the gym 24-7, such as some of the trainers. Not that that's not ok, I just feel like they have to work a bit harder to squeeze in the time for training. Either way, all of those men and women are awesome–super talented to be able to do any of the obstacles! I don't think I'd make any of them... especially since so many require upper body strength. I really liked the navy dude with the therapy dog on this week's episode, and I find myself getting super excited for the folks that make it far/to the end, and bummed when they don't. 5. It's another weekend of no races. Can you believe it? My schedule was so race heavy for a while there, it seems so weird not to have anything. Not that there wasn't a race this weekend I wanted to do, but having gotten a 3-day pass for Lollapalooza, I didn't think my body could handle any more beatdowns. It's crazy how exhausting this festival is, especially the older I get (not to mention all of the running back and forth in order to see all of the bands you want to see). Last year I went two days (unable to get the 3-day like I wanted... you used to be able to wait a few days prior to buying, but just like runDisney events, tickets began to sell like hotcakes and they sell out in hours, if not sooner)—so I did Lolla on Friday, a packet pick-up in the city Saturday, Biggest Loser 5k Sunday, and then Lolla Sunday afternoon. Saturday night I ended up with food poisoning (being up all night was no fun) so Sunday was pretty rough, but I wouldn't let myself not do the race or miss the festival. All was well after taking a nap after the race and drinking some ginger ale ;) I just got a later start for Lolla than I had intended. BONUS: A little something extra for you. I started reading 'Doctor Sleep' this week, which is the sequel to Stephen King's 'The Shining'. Great reads, if anyone is interested. Thanks to Courtney, Cynthia, and Mar for hosting! 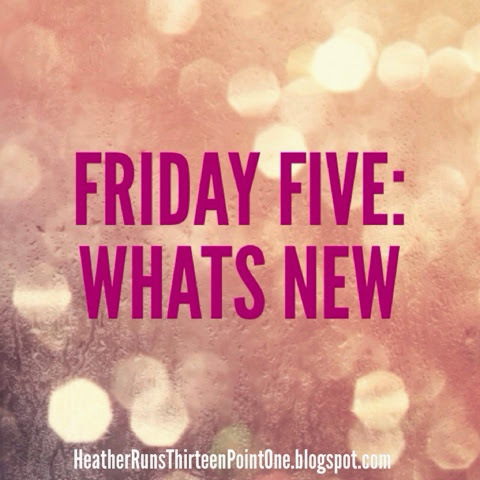 Make sure to check out their "Friday Five" posts (I'm on the train using the Blogger app to edit my original draft and can't figure out how to add links to their direct link up pages... I'll add them when I'm at a computer, but you can click above links to get to their pages) and link up if you are joining in, and then check out some of the other link up posts – so many great ones to choose from! I took a Barre class yesterday for only the second time. It was outside and I guess I can get used to liking it but I like to move more! No big plans this weekend except getting in my long run miles for marathon training! Yeah, it was strange staying mostly in one spot using such small movements, but boy did I feel the effort of it! haha. Outside sounds like it could be fun! Hope your long run and marathon training are going well! Haha, you are not the first blogger this week to say you are obsessed with America Ninja Warrior! It must be pretty popular. I don't watch though. Good luck with your inserts. I tried a pair ( I didn't really need them but I got them for free) and I walked 10 miles in them and came home with blisters on my heels. I hope it turns out better for you! I saw that book in the library. I didn't know it was the sequel to the Shining. Thanks for the tip! I've never watched American Ninja Warrior- seems everyone has been mentioning it! I don't think I ever would have stopped to watch it myself, but a year or two ago my husband was watching it, and it's addicting once you get into it!